To use our port forwarding feature, simply connect to cryptostorm then visit http://10.31.33.7/fwd and follow the instructions there. On that page, choose a port between 30000 and 65535 then click the "Enable" button to activate the forwarding. Next, you tell your Bittorrent client to use that port. BitTorrent will still work correctly on cryptostorm even without this type of port forwarding. The problem is that some peers in the swarm refuse to seed to peers who don't respond to direct connections. With this setup, a temporary forwarding will be enabled between the VPN server's exit IP and your IP. Your internal VPN (10.x.x.x) is used for this forwarder, NOT your real IP. Once enabled, you should see increased speeds for whatever you're downloading/uploading since more peers will now seed to you. This port forwarding is temporary. When you disconnect from the VPN, the forward will automatically be removed. And yes, we did take into account the "Port Fail" vulnerability disclosed by Perfect Privacy a few years ago. 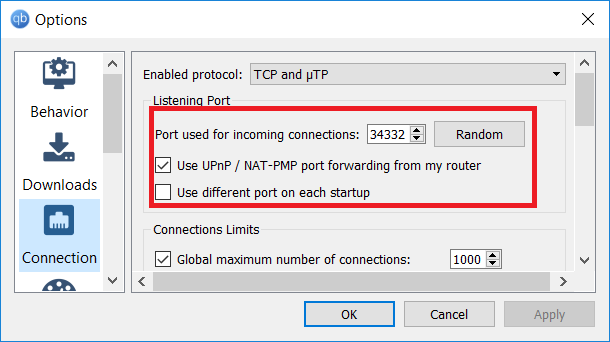 Under a normal port forwarding setup, clients on the same VPN instance would be able to connect to each other, which could disclose a client's real IP. We use a certain iptables rule so that clients can still connect to each other, but their real IP stays hidden.